About eight years ago, I made a trip to Taipei after not having visited for over 13 years. 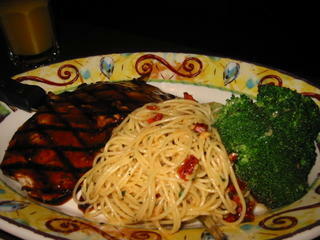 One of the first places my uncle to me to eat was Tony Roma's. It's sort of funny that he assumed that I would want to eat American food when at that time as a tourist, I wanted to eat Taiwanese food, night market food, beef noodle soup, dumplings. Now as a often-resident of Taipei, I can enjoy the luxury of eating both Asian and American foods here. The first time I ever ate at a Tony Roma's was in San Francisco, with a group of friends- all but one who had never been there before. Each of us ordered something other than the ribs, except for the seasoned friend, and when our orders came we each regretted it and eyed his ribs instead. So the same applies here- order the ribs- regular slab, original flavor, with a side of corn on the cob and a baked potato. At least that's what I usually get. They have a small selection of starters (NT$210) and salads (NT$320-380), some sandwiches and burgers (NT$330-350), and a large selection of meats- ribs, steaks, chicken, seafood. 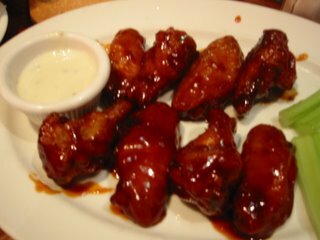 The Carolina Honey Wings are a stingy 8 pieces for NT$210 (about $6). The skin is a nice crispy and sticky sweet crunch in your mouth, but you definitely need the wetnaps afterwawrds. The caesar salad is pretty ordinary but relatively fresh. 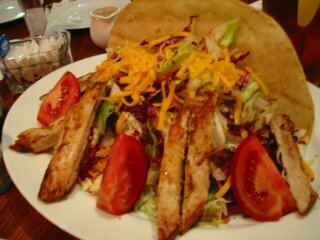 The Santa Fe Salad comes with a crispy tortilla shell that looks like a giant taco shell is surprisingly tasty, while the salad is underwhelming with a weird mustard dressing. Everything is a tad more expensive than in the states, but the ribs are worth it (half slab NT$520, regular slab NT$660, full slab NT$860). 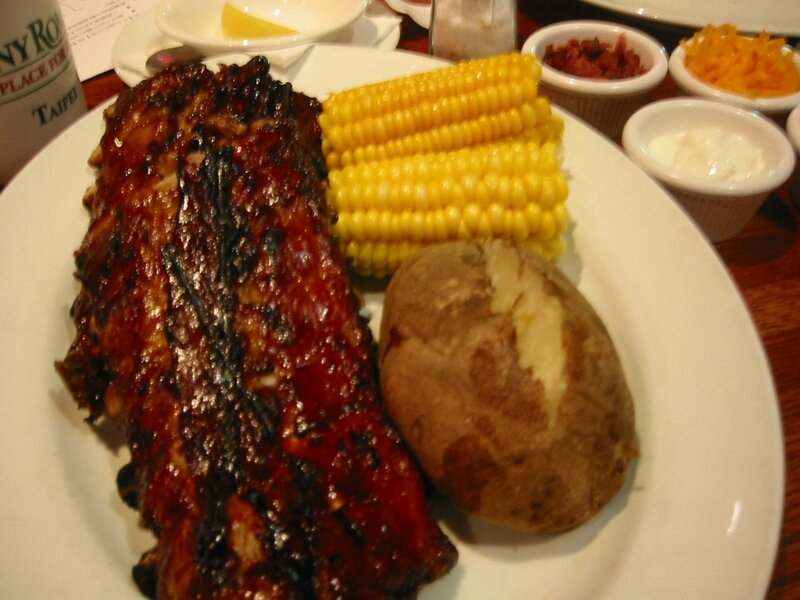 The ribs are usually fall off the bone tender, with a sweet bbq sauce slow roasted flavor. Two of three times I've eaten here, all the ribs were tender and delicious and perfectly flavored. The third time, some of the meat on the ribs were a little tougher and slightly overcooked compared to the moist ribs of my previous experiences. The baked potato is a good medium sized potato with the option of having it loaded with all the toppings (cheese, sour cream, butter, bacon). The corn is usually pretty good too, but on this same third occassion, it was very dry and starchy and also not hot at all- as if it was frozen after being microwaved too long and then plated after it had been thawed. I took a few bites and disappointedly left the cobs on my plate. I almost wanted to complain. The first time I took take out from Tony Roma's I actually did complain. I was craving baked potato (for some reason) and ribs and got an order to go. After picking it up, returning home, and plating it up, I noticed that all the sides for my potato were there, but not the potato itself. I was pretty upset to tell you the truth- I did not want to drive back just for a potato, but I also really wanted to eat one. I called and complained because I did want them to know and the hostess was very nice and said that they would take my name and "replace" the potato the next time I went in. I thought it was sort of silly, but we actually did that, and in addition to the free baked potato they offered a 15% off discount from that night's meal. I thought that was service that made me want to go back. The service is generally friendly, but not perfect. Sometimes all the waiters are grouped nearby and sometimes they all disappear together. Sometimes they refill your mug of water and sometimes you have to wave them down. There are many booths and tables so it's good for large groups or those with families. There are also many couples and people in business suits. The red neon Tony Roma's sign out front makes it a little easier to find, as the entrance is on the side. Noticeably, the third night I was there, they played a collection of old songs that seemed like a blast from the past including "Rush Rush" by Paula Abdul and "Wannabe" by Spice Girls. It wasn't bad, just amusing- like they were playing an old corporate cd from six years ago or something. 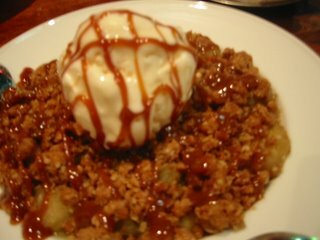 The two desserts we got (NT$100-250) were the Skillet Cookie Sundae and the Apple Crisp. The Apple Crisp has a layer of mystery granola crisp stuff that is a little too crispy and sweet over the apple filing which tastes good with the scoop of vanilla ice cream. The Cookie Sundae which only comes in chocolate chip, looks a lot bigger in the menu's picture and should probably be eaten hot. We ate ours lukewarm and it was dense and had hardened and all the ice cream melted over it. 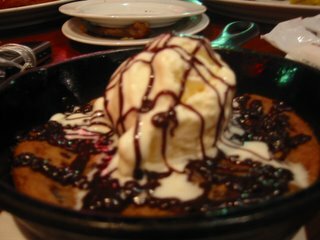 I'd stick to the Pizookie from BJ's. So the rule of thumb from my very first visit still applies here too- don't order anything else, just the ribs. That's what they are known for, and everything else is not as good and not worth the prices that they charge. Anyone who has eaten pizza in Taiwan has probably noticed the different toppings that are popular here such as corn, peas, squid and seafood. Often, it's not not good, just weird. As a kid, I loved pizza from Little Caesars and Pizza Hut. As a college student, I loved pizza from Zachary's and Fat Slice (go bears!). As a working 20 something, my pizza choice was CPK and Papa Johns. So what to do when none of those places are here in Taipei- except Pizza Hut? Order delivery! I haven't stepped into a Pizza Hut restaurant here, although it always looks very crowded and I believe they have the lunch buffet option. I'll have to try it sometime. But the delivery here is surprising quick and easy. They have special "set menus" if you are ordering for one or two, which is NT$398 (about US$12) which includes a small pizza (with 6 slices), buffalo wings and a liter of Pepsi. Their bigger pizzas range from NT$340-650 depending on the sizes. They also have pan crust or thin crust. I like Pizza Hut for their pan crusts. There's a crispy, chewy texture that is slightly greasy but fulfilling at the same time that is uniquely Pizza Hut. 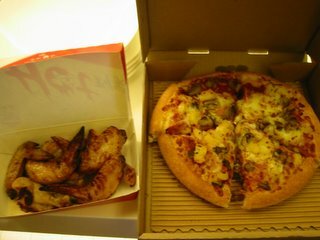 Also, why I prefer Pizza Hut over Domino's, which they also have in Taipei. They have different sides like wings, garlic bread, waffle fries, pasta, and potato skins. 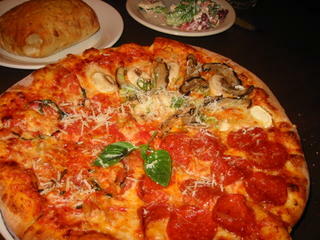 I got the set menu with a Hawaiian pizza (pineapple plus canadian bacon) and added mushrooms (+NT$45). The first time I ordered it, I devoured the pizza and was extremely satisified with it, except that I accidently ordered the original BBQ wings instead of the spicy Buffalo wings. The second time I ordered it, I accidentally ordered the BBQ flavor again. The wings/legs are decent- slightly sweet BBQ flavor instead of the traditional spiciness that I will have to remember to distinguish to order next time. The pizza the second time, I noticed that the mushrooms were canned instead of fresh mushrooms which have that watery canned mushroom taste and the canadian bacon seemed like regular ham. I guess I didn't notice the first time under all the cheese. If I order again, I'll probably try it with pepperoni instead of ham or just try a different flavor entirely. I've also had the seafood flavor with local friends before which I personally don't prefer- it comes with a cream sauce instead of tomato sauce and is a bit too rich for me. You gotta have pizza with tomato sauce! The first time you order, you can browse their English website which you can check out all the toppings and see pictures. You can then browse the store list to see which one is closest to you to order. Because a lot of foreigners order from them, they usually can speak enough English to take your order. With your delivered order, you'll get a mini delivery menu with pictures to keep handy for the next time you have a craving and don't want to deal with cooking, driving or parking! The XinYi area is full of shopping and eating experiences- 101, the Warner Village and movie theaters, NY NY and Neo 19 buildings and the multi-collective Mitsukoshi shopping malls. When the new Eslite building opened up across the way, I figured it would be another one of the same, but actually it does offer a variety in experience- there is a multi-level bookstore, stationary section and a tasty looking food court. This day I only had the chance to have a snack- so I opted for peanut do-hwa (or soy tofu) with mini boba and my friend had red bean with mochi balls. As with many food courts in Taipei, the signs are frequently not English friendly, but there are lots of bright pictures and plastic foods to point at. Lucky for me, my Chinese for foods I like is improving, and they had a picture of what I wanted nontheless. You can opt to have the dessert hot or cold and we had ours hot that day. The peanut do-hwa was a pleasant warm, with the right amount of sweetness in the soup, and the soy tofu was a silky melt in your mouth that didn't taste artificial as some mall do-hwa soy tofus can (like from the dessert shop at the food court at Warner Village). The peanuts and mini-boba tasted fresh and combined to give my mouth a variety of consistencies to enjoy. 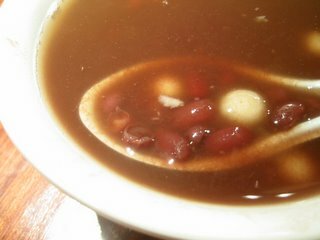 The red bean soup was much hotter (in temperature) and sweeter as well. The thickness and sweetness combined would be good on a rainy day, but I preferred the lighter textures of the soy tofu. 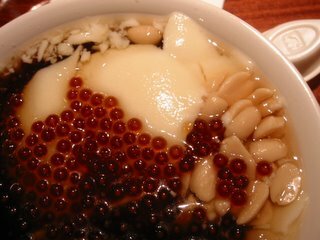 The service was fast, despite the mini-line, and you can choose a variety of combinations in your soy tofu and other desserts like ai-yu lemon jelly. And you can't beat the price from NT$40-NT$55, which is like $1.30-$1.90. Cheaper than most lattes and more filling. Also, a good alternative to shaved ice for a local dessert to try, especially when it's chilly outside. I just reread my review of Diamond Tony's and it reminded me of how much better Macaroni Grill is. Macaroni Grill is reliable, pleasant and tasty with a good selection of appetizers, pastas and deserts that you would find very similar to what you would eat in LA. Some people would want to be surprised, for me, I like the fact that I can count on going to dinner there knowing what to expect every time because I usually reorder what I like. It's hard to find a good salad in Taipei, in my opinion, but Macaroni Grill doesn't disappoint with large share-friendly portions. 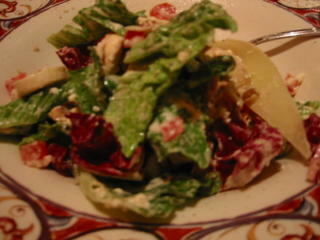 Their Caesar is a nice twist on the original, with chopped tomatoes and raw mushrooms. I also like their other salads which are spinach based- one features pine nuts and orzo rice and the other one includes arugula and strawberries. 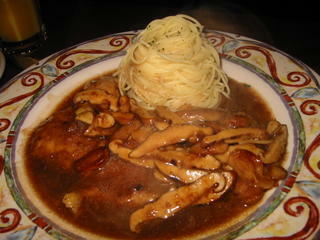 I love mushrooms, so I really like their Chicken Marsala which comes with the slightly sweet and salty sauce, a 3-4 pieces of thin chicken, and side of pasta, topped with lots of slices of shitake mushroom. I prefer this over the honey balsamic chicken because that sauce is too sweet and tangy for me. The pasta for the honey balsamic chicken also comes with sundried tomatoes. Their steak with the mashed potatoes is also quite good. The pizza choices at not as wide as CPK, but has the standard favorites BBQ chicken, Pepperoni and one called Four Seasons which has four different sections of one topping- mushroom, pepperoni, bruschetta and canadian ham. The first time I tried it, the canadian ham was way too salty for me, so they've been accomodating to let me have "three seasons" instead and replace the ham with more of the other flavors. The crust is chewy and crispy at the same time and it's a good sized pie for the price that you pay. The sauce is not too salty and it's the right portion of cheese and toppings. The bruschetta and mushroom toppings are a refreshing choice. It's probably the best deal and best crust of all the places I've had. I've had most of their pastas- the lasagna, the spaghetti and meatballs, the seafood creme pasta, the shrimp angel hair. The portions are huge- usually shared family style- so you sometimes have enough to take home as leftovers. 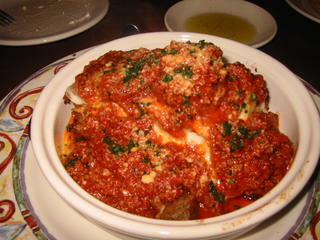 The lasagna that day was a bit too salty for me. The angel hair was a little too fine and dry for me, tasted almost like a chinese rice noodle- I'd probably order the spaghetti and lasagna over the angel hair. Like Chili's, the atmosphere is boisterous, booth and table style seating where families, business lunches and birthday celebrations are all happening at the same time. They have separate Chinese and English menus, upon request. It's pretty crowded, so you should make advance reservations if you have a large group and want to be seated right away. The waiters are usually pretty good about the service and understand if you order in English. The desserts include tiramisu, chocolate cake, panna cotta, berries with creme and a chocolate swirled cheesecake. My favorite is probably the cheesecake with the oreo cookie crust and the creamy richness of the cheesecake. Big enough to share, but you can eat one yourself if you really have a sweet tooth. I would eat the warm chocolate cake at Chili's over the Mac Grill chocolate cake which is denser and fudgier, but the tiramisu is a not too sweet good choice as well.